A series of lightweight aluminium football training goalposts for soft or hard surface use. Suitable for school, university and commercial sports facilities. Made from 80mm alloy tube steel the goalposts are available in several sizes with options for anchoring on both grass and artificial playing surfaces. Optional lifting wheel attachments and transport trollies are available. 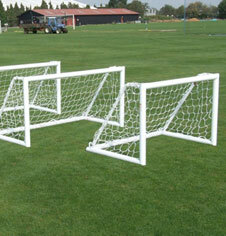 Price is per goalpost and includes U Peg hoop anchors and polyethylene FPX goal netting. Single 1.5m x 1m aluminium freestanding training goals. Single 2m x 1m aluminium freestanding training goals. Single 3m x 1m aluminium freestanding training goals. 2.44m x 0.8m aluminium freestanding training goals.